The other day, I was feeling really glad about being a mallu. The specific context was accidentally coming across the below song. I'm so glad that I can enjoy the incredible beauty of that first line. Somebody on YouTube has tried to translate Sooryakireedam veenudanju ravin thiru arangil as, "The crown﻿ of the sun falls and shatters in the sacred stage of the night." Meh - it's so funny that even the translations that convey the literal meaning of the line can never capture the essence and the beauty. But tonight, I'm feeling glad about being a mallu for another reason altogether. I'm so glad that I know there are better movies being made in India than the ones Bollywood churns out. I'm so glad that I don't think Aamir Khan is the last word when it comes to "good" cinema (quite a few people do believe that, by the way). Call me parochial, and see if I care. Considering that it's always Bollywood movies that become India's official nominees for the Oscars, I really don't care if I'm parochial. Tonight, I watched 5 Sundarikal (literally, Five Beautiful Women), a compilation of five short movies in Malayalam, directed by five different directors. And it was so worth it. I sat there feeling absolutely complacent and content. 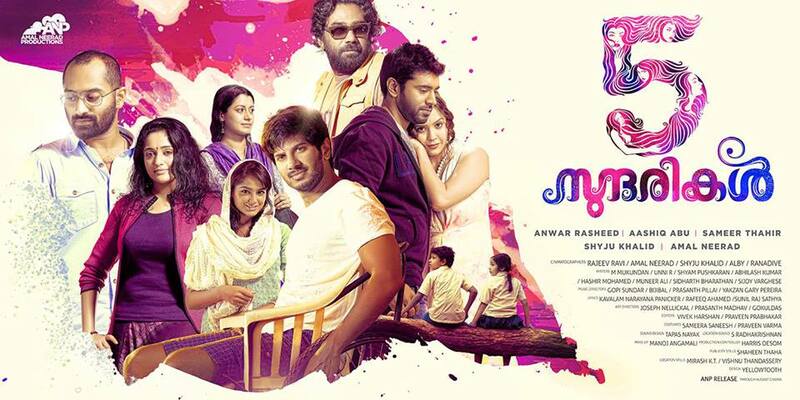 The quality of music in Malayalam cinema might have gone down since the days of Sooryakireedam, but Malayalam cinema as a whole is staging a comeback alright - and how! Or is my over-reaction caused by the fact that the last movie I watched was Yeh Jawaani Hai Deewani, which (I now realize) was the most atrocious piece of junk ever? Quite possibly. Many may dismiss at least a couple of the movies in 5 Sundarikal as needless tugging of the heart-strings, but I don't think anybody would be able to dismiss them as ordinary or stereotypical in any way. And it's nothing to do with the acting, by the way. Though the films boast some of the biggest 'new names' in Malayalam cinema (Kavya Madhavan, Biju Menon, Fahadh Faasil, Dulquer Salman, Nivin Pauly, etc), the directors and the script-writers are clearly the stars here. And that, to me, is a sign of good cinema. If the movie doesn't depend on the stardom of the lead actor, if any good actor could have done that role without compromising the movie - that's good cinema. It may seem contradictory, but the short format seems to have given the directors the luxury of taking their time. Most of the movies build up very slowly - layer upon layer till the inexorable ending. The first movie especially was beautiful. I was thinking, "No no no.... Don't let that be happening..." all the way to the ending. Two of the other movies have twisty endings that you don't see coming. The only movie I didn't particularly like was the second one, which was slightly random and pointless. So if you're a mallu - go watch this movie. If you're not - well, too bad for you.